Nerve Filter is the instrumental side project of Assemblage 23's Tom Shear. 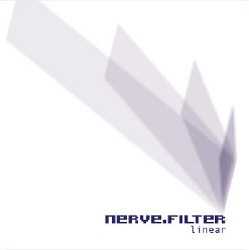 Originally created back in 1995 in an effort to break a bout with writer's block, Nerve Filter was a drastic departure from the sound of Assemblage 23. Although a few tracks and remixes by Nerve Filter were released over the years, the rising popularity of Assemblage 23 meant that Shear didn't have as much time to devote to the project, so an offi cial full-length release never happened. Until now. Breaking ranks from even the previous Nerve Filter material, ôLinearö defies categorization. Fusing elements of drum'n'bass, IDM, ambient, techno, dub, electro, and more [sometimes in the course of a single song the album is an unpredictable and varied affair that is sure to suprise both fans and critics alike. Combining intricate, futuristic rhythms, complex arrangements, tweaked out synth lines, lush atmospheres, disembodied samples and impeccable production, Nerve Filter jumps from genre to genre effortlessly, twisting tracks in directions far from their origins.